Officials say a Berks County woman gave birth in a restroom at her work and left the baby boy partially submerged in the toilet. 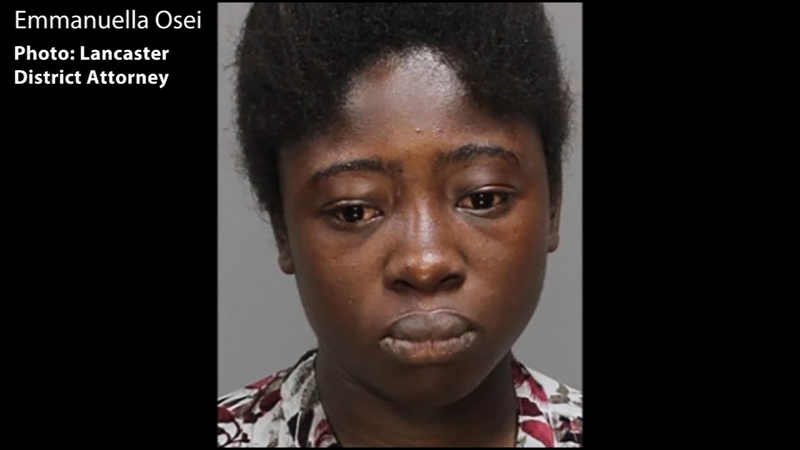 Police in Lancaster County say 23-year-old Emmanuella Osei has been charged with felony endangering the welfare of a child. The Lancaster District Attorney's office says Osei was working at an assistant living facility on Monday night when she told colleagues she felt ill. She went to a restroom and phoned her supervisor, asking them to call 911. Police say she never mentioned that she'd given birth. Police say they arrived to find Osei in the bathroom surrounded by a large amount of blood, and discovered the baby. The baby is at a hospital on a ventilator, in stable but critical condition. She is the oldest looking 23 yr old I have ever seen. She looks like a Granny. On the picture of the right...what's up with her cheek? I was trying to figure that out too. At first i was like is that a tumor? And what is up with that crazy hairline? The fact that this stink bug worked in an assisted living facility with the elderly and disabled really concerns me. I hope she is banned from working with any vulnerable population. A Pennsylvania woman who gave birth in a restroom at her work and left the baby boy partially submerged in the toilet has pleaded guilty to felony child endangerment. Emmanuella Osei entered her plea during a court hearing Tuesday. The 23-year-old Reading woman faces up to 10 years in prison when she's sentenced later this year. The baby was hospitalized in critical condition but has since recovered. He was placed in a foster home. The woman left the baby boy partially submerged in the toilet, according to authorities. I don't want this stink bug to get the baby back. I hope she does not get a lenient sentence because she plead guilty.